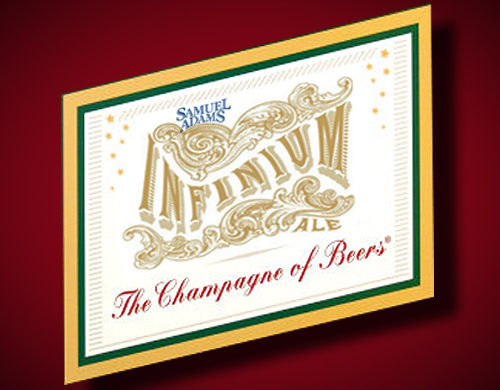 You are here: Home » Sam Adams Infinium: The Champagne of Beers? Sam Adams Infinium: The Champagne of Beers? Hmm..where have we seen this before? Update 1/3/11: Don’s review of Infinium – he loved it! Click here to read Don’s Infinium review. Update 12/9/10: Our pal Daniel got his hands on some and put together an entertaining (and profane) review of Infinium. Click here to read it. Update 12/3/10: I just called my local go-to beer stores, and they don’t have it yet and aren’t sure when it’s coming in. Make sure you get on a list! What seems like a simple announcement by the folks over Sam Adams has sent my mind racing. Later this month they will be releasing Infinium, a champagne-like beer intended to replace your bubbly this New Years Eve. It might be the head cold I’m fighting right now, but I’m finding it difficult to wrap my head around the implications of Sam Adams’ latest move. First off, a bit about the brew. 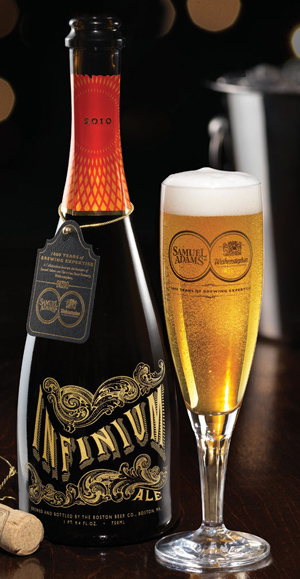 Infinium is the first of three beers Sam Adams will brew in collaboration with the Weihenstephan Brewery in Germany. All of the brews will conform to the Reinheitsgebot (guzentight! ), the German Beer Purity Law. Whatever the implications of this brew are, I'll be picking a couple up for New Year's - it looks tasty! Infinium is what you’d expect from a beer dressed up in a French tux – it comes in a corked 750ml bottle, it’s light gold in color, has a flavor described as “crisp and dry” (it’s brewed with champagne yeast) and will ring in with an ABV of around 10%. Infinium will retail for $19.99 a bottle, placing it in the upper levels of premium craft beer. But enough information, time for some speculation – what are the implications of the way this brew is being marketed? Infinium is certainly not a new concept in beer, as many professional and home brewers have used champagne yeast to give their beers a unique flavor, and many have even added grapes to the mash. But the fact that Sam Adams is taking direct aim at unseating Champagne as the toast of New Years Eve is telling. Either they think that America’s perception of craft beer has evolved to the point where run-of-the-mill beer drinkers and wine lovers are ready to replace their New Year’s Champagne with beer, or Sam Adams just wants to push the issue in hopes of making folks see beer in a new light. Or perhaps they know that as beer nerds, many of us haven’t bothered with Champagne on New Year’s Eve for years. Instead we hoist an Allagash Victor, a Chimay Grand Reserve or any other number of fancy beers. Maybe they want Infinium to be that beer this year, as they see the top of the premium beer market being cornered by folks like Dogfish Head and The Bruery. Or maybe Jim Koch and the gang just thought it’d be fun for beer lovers to have a well-crafted novelty brew to enjoy with their friends as the ball drops. Or perhaps it’s all of the above. Like I said, I’m having trouble figuring it out while this damn cold is making the room spin a bit. I’ve put together a quick poll to see what the collective genius of B&WB thinks. Give a click and vote and let us know your thoughts below in the comments. ← Elysian Night Owl Pumpkin Ale: Weird, but Surprisingly Good. I don’t think there is any big plan. I think they were more thinking about the collaboration more than anything else as they haven’t really done one yet. I had a chance to see the company’s internal powerpoint about the brew and it didn’t mention any of the things your cold infused conspiracy minded brain came up with. I think they are definitely excited about the collaboration and the product. If it works as a champaign substitute on new years so be it. I know that is the bottle of bubbly I’ll be cracking open, and probably drinking mostly myself as I’m really the only one that likes beer in my household. But it will be fun, and should be a good brew to ring in the new year. I’m not sure their PowerPoint (especially the one you saw) will share their internal business strategies. They probably don’t let that stuff out of the building Don. I’m guessing what you saw was the rah-rah stuff for distributors and beer store owners, which told about the beer, highlighted what makes it unique and fun, and pumped up how many people would flock to buy it. Don’t worry, people will pay $19.99 for this! Companies don’t share their strategies with retails. Maybe the tactics, the “what” they’ll do to whip up excitement and sales, but not “why” they are doing it. Good point. I still don’t think there is any “big plan” to somehow unseat Champaign for new years, but maybe push it over a bit. I know they’ll get my $20 for a bottle! Mine too. But new product development just doesn’t happen on a whimsy, and the folks over at Sam Adams have proven they understand the business of beer. A unique product like this is usually designed to fill a unique need or opportunity that’s been identified in the marketplace. This one might kill a few birds with one stone. If by “mean” you mean charming, smart and handsome, then I confess – you got me! I don’t think Sam Adams takes themselves as serious as you may think. It was probably a fun brewing experience for them and if the product does well… bonus! Thanks Brandon for being a voice of reason…Sheesh! I’ve been drinking “fancy” beer for years now instead of sparkling wine (that stuff always gives me a headache after half a glass). I think this is strictly marketing; most people who don’t drink craft beer have no idea that there is beer out there that can compete with a sparkling wine. However, I have mixed feeling about this campaign; on one hand, a large craft brewer such as Sam Adams has the ability to educate the masses, and more good beer is produced. On the other hand, they have the ability to educate the masses (yes I said it again) and there is the possibility that good beer flies off the shelves faster and becomes more difficult to find. With that said I’m looking forward to trying Infinium. I’ll be curious to see if this one’s a hard to get beer, or if you’ll see them on the shelves in February. Either way I’m going to grab mine ASAP. Interesting post. I wouldn’t worry too much about their strategy (sell more beer???). Let’s get down to basics… is it any good? I’m curious to try it and see how it compares to a Saison/Farmhouse Ale, which I sampled quite a bit of this past summer. The great ones, i.e. Saison Dupont & Goose Island Sofie, came across as very champagne-like. Could make for an interesting New Year’s Eve challenge! Infinium vs. Saison Dupont vs. Piper Heidsieck Brut = FUN! I’m thinking this will be a good beer, between the collaboration and keeping to the Reinheitsgebot (first time I’ve written that without looking it up, BTW), I think it should be a good beer. I know the aim is to sell more beer, but the way Sam Adams is going about it struck me as very interesting. It’s new. Why not? When you can crank out stuff like the Utopias? I think Jim is right is a few ways – just look at the package. That’s a bottle you can be proud to bring to any New Year gathering and people might even think you have some class! (Its like the beer as a gift thing from way back – the corked bottle just seems better, right?) Count me in for one even though I’ll likely be drinking it alone in my basement. Still, I’m impressed with this company. I forgot to mention the packaging, Scott – good catch. It’s the perfect thing for a beer nerd to bring to a New Year’s or holiday party as a gift. It’s the kind of beer that wine people will give a shot and probably like, leading to more of an appreciation for craft beer. I hear you JIm! Its illegal in Idaho too. However Jim and I got some at the GABF, and it made my whole right side tingle! Sorry. Texas does have some wacky laws, but Utopias doesn’t exactly grow on trees up here where it’s legal either. I think you and I are in the same boat – if we want it, we have to hit eBay. Not sure that makes you feel any better, but it was worth a shot. I can’t wait to get my hands on Infinium. I keep calling around and I’m on a couple of lists, but I have yet to get a taste. Patience, I guess. Sorry Jim L but you were mis-informed. Utopias was sold in Texas, both the 2007 and 2009 releases were sold here, though the 2005 was gone before the beer was approved for sale. If you live in Austin, the reason there was no Utopias available is that the distributor tried to strongarm BBC into selling them more. They wanted twice their allocation or none, and got…none. Houston, Dallas and San Antonio all had around 10-24 bottles for sale in 2009. I think there are a lot of craft beer drinkers that don’t care for champagne headaches. Looks like others agree with you, Matt. My tinfoil hat theories aren’t finding many takers. I’d like to think that this is just a fun release, too. While you’re at it, take Mom’s Bra of your head too. I really can’t think of a context that makes this OK. Welcome to the Beer and Whiskey brotherhood, Matt, where cringes are like hugs. Great post and I’ll definitely look for this now that I know it’s out there. I think it will be cool to bring in the new year with something different, even though I look forward to that champagne. The packaging is genius. I must say I feel kinda weird after reading through all the comments. Justin, every once in a while we just spew our brotherhood around all over everyone. It’s cringy to say the least and not for the weak hearted! yeah…I do…so what? You got a problem with that? Where can we buy it? No craft beer suppliers by me or state stores (PA) seem to carry it? I don’t know, Ray. I think it’ll be hitting the shelves soon, but not yet. The trick to this (and all other good beer releases) is to get to know the folks at the best beer store around you. They can let you know when stuff is due in, and in many cases will hold the goodies for you. At my beer store, stuff like Founders Nemesis and Sam Adams Utopias never hits the shelves. It’s reserved for the “in the know” crowd who have made connections with the employees. In other words, stop in and ask for the “beer guy” and make a new friend. You’ll be happy you did! I think in good faith you need to direct people to your newest post about your beer problem. Getting to know the beer guy is like getting to know the neighborhood crack dealer. And if we had to guess, how many bottles in a case (as they would be shipped to a distributor)? 12. The bombers typically come in cases of 12, just like wine. You guys do know Weihenstephan did contact Samuel Adams and not the other way around right? I like it when our readers are smarter than us. I just wish it didn’t happen so often. Hey Jim and Don, I just recently discovered your blog via a re-tweet by Finch’s Brewery here in Chicago. I’m really enjoying it. Very informative, fun, and the writing style is really entertaining, kind of the way I’d like to think my own beer blog would be if I ever started one. Funny, dry wit, sarcastic, but ultimately making a salient point. Jim, where are you in Jersey? I lived there for many years and spent a few college summers on the shore. It’s been too long since I’ve been back. I’m Jonesing for some Taylor Ham. And I haven’t had Taylor Ham in years. I guess I take it for granted, like I bet you do with Goose Island. If I was out by you, I’d get a Bourbon County Coffee Stout I.V! Yup. They wanted help, they couldn’t thing outside the box where Reinheitsgebot was concerned. SA to their credit were very interested, and relished the opportunity to “help” a German Brewery with a Reinheitsgebot issue. Where in San Diego can you buy Samuel Adams Infinium? Dina, it will probably be available in your usual outlets for Sam Adams beers. I know that we won’t see any out here in Idaho until after the first of December. So I would look for it to hit the shelves around the first of the month. It’s launching this month, Dina, and will be rolling out at different times across the country. Your best bet is to call your local beer store (the best / nerdiest one) and ask them when it’ll be coming in. Sometimes they’ll even hols a bottle of two for you if it’s something rare. Good luck! It’s hitting my local packie at 9:45 doors open at 10 I have a representative purchasing for me. Nice! I wish I had a “representative” to do my beer bidding! Monday here Scott. I’m going to pick one up, but I’m pretty sure there will be enough. my store is getting 10 cases and has only presold a couple.